When Gus Van Sant announced in 1998 that he was planning a shot-for-shot remake of Psycho, I got kind of unduly excited about the project, largely because I took the phrase “shot-for-shot” way too literally. Somehow, based on remarks Van Sant made in interviews at the time, I got the impression that he intended something truly avant-garde—that he was going to do his best to duplicate every single one of Hitchcock’s compositions, except in color and with a different cast. To prepare for this off-the-wall experiment that existed mostly in my head, I watched the original Psycho three days in a row, on the Tuesday, Wednesday, and Thursday prior to the remake’s Friday opening. And while I was sorely disappointed to find that Van Sant had made any number of small changes (no, dammit, the car salesman entered frame from the right! ), watching the new version after carefully committing Hitchcock’s to memory did make it clear just how much screen acting has changed since the days when actors could be treated like cattle. Screenwriter Joseph Stefano, adapting Robert Bloch’s novel, employs an odd device here that I can’t recall encountering in any other film: Marion imagines conversations that haven’t happened yet, predicting how her boss, her sister, and the oilman whose cash she swiped will react when she doesn’t show up for work on Monday. (You see this kind of hypothetical flash-forward from time to time, but this is the only instance I know of that confines it to voiceover.) It’s an elegant solution to one of cinema’s more intractable problems: how to convey what a character is thinking when he or she’s entirely alone. What’s more, it’s exactly the sort of useless speculation in which we all indulge at times of great stress—in effect, we become screenwriters (or perhaps playwrights) ourselves, inventing plausible dialogue for the people in our lives, anticipating their behavior. The sense of accumulating guilt and anxiety is palpable. 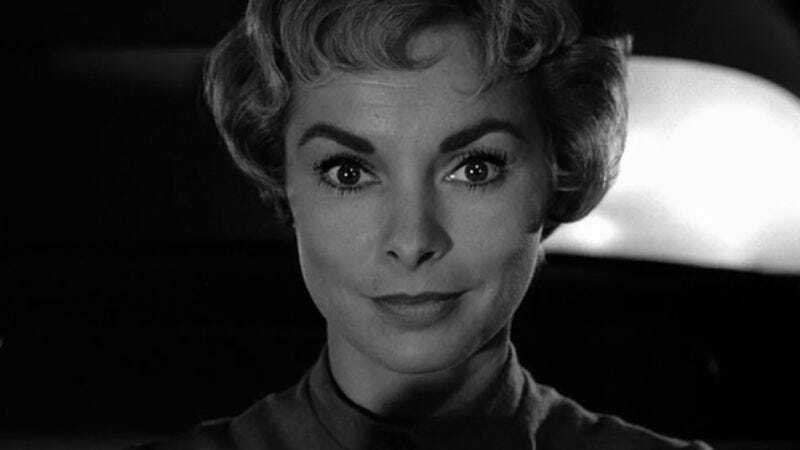 What it boils down to, I now believe, can be summarized in the admittedly condescending phrase “they had faces then.” Which is not to slight Janet Leigh’s talent in the least—she richly deserved her Best Supporting Actress (spoiler!) nomination for this film. But there just aren’t many people, however talented, who could hold the camera with a steady gaze the way she does over the course of these few minutes, while doing relatively little in the way of overt emoting. Hitchcock was notorious for being obsessive about the appearance of his leading ladies—there was a very particular sort of hauteur that he responded to, which probably found its apotheosis in the marginally talented (at best) Tippi Hedren—and I doubt that he would have shot this sequence the way he did without a truly arresting physiognomy at his disposal. Leigh does subtly expressive work with her hands on the steering wheel, shifting her grip in time with her emotions, but her eyes bore straight through you. And then comes the smirk. In an earlier scene, Tom Cassidy, the oilman whose 40 large Marion stole, had hit on her in the sleaziest possible way; it’s easy to imagine her smiling at the thought of his anger when he discovers she’s ripped him off, and that’s exactly how Heche plays the moment. (The smile is not in Stefano’s screenplay, incidentally. He writes “A look of revulsion makes Mary [the character’s original name] close her eyes.”) Leigh doesn’t smile. She smirks. What’s more, she smirks as she imagines Cassidy threatening to replace any missing money with “her fine, soft flesh.” It’s a bizarrely masochistic expression, subtle but deranged, and utterly at odds with the character as we’ve come to know her; if you were told that Psycho was the story of a person with multiple-personality disorder, and then shown only a single frame of Leigh’s smirk, you’d immediately jump to the conclusion that she was the crazy one. Was this an attempt at misdirection on Hitchcock’s part—a means of equating madness with a female figure, ensuring that we never suspect Norman Bates in the slightest? Or did Leigh arrive at that look on her own? Either way, the rain starts falling and she quickly snaps out of it, looking around for a place to bed down for the night, and maybe take a nice hot shower.